Before I get into this article, I want to start by saying that this is simply some information that I have found and come across many times throughout my life. I want to remind you that anything done too much can be, and usually is bad for you. Remember moderation is the key, do things in moderation and don’t go overboard. I don’t want people to misunderstand what I’m saying in this blog post and take it as me saying, yes tanning is completely healthy and it will never hurt you, because obviously that isn’t the case. We all know that tanning in tanning beds or outside could be harmful and should be done with caution, which is just like anything else in life. We always hear about tanning beds and skin cancer but rarely do we ever hear about any of the positive effects of tanning beds. I just want to bring to light some of those facts that many of us have no idea about. There are two sides to any story and all things have good and bad qualities. When making my decision to tan or not to tan I look at all of the tanning bed facts. Always weigh the tanning bed risks as well as the benefits and make an informed decision for yourself. With that being said let’s get to the good stuff, my interesting and informative article about the positive effects of tanning beds. 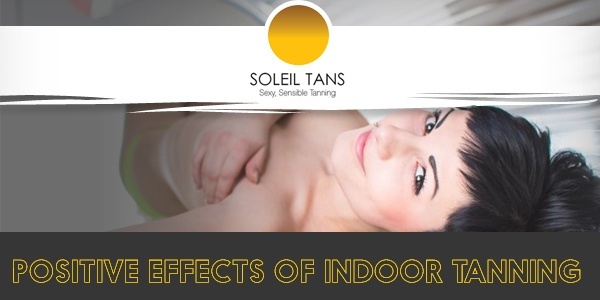 During my research about indoor tanning I have found some very interesting facts about the effects of tanning beds and the effects of the UV light, which is what the tanning bed light bulbs emit. It seems that there are many proven benefits of spending time in our beloved tanning beds. I got most of my information from a website called UVtalk, If you are a regular tanning bed user or if you just tan for the summer I highly recommend checking out this site. It may come as a surprise to many people that tanning bed use is regulated by the FDA. The government regulates how long a session can be, how often you can tan, and even what the tanning salons are allowed to tell you. Tanning salons can’t tell you that exposure to UV light actually has health benefits. UV light is how the body produces vitamin D. Harvard researchers found that exposure to UV light increases production of a protein that is known to fight cancer. Even as early as 1940, researchers knew that people who spend time in the sun were less likely to die of cancer than those that spent their time indoors. Doctors claim that vitamin D requirements can easily be met by oral supplements, but a recent study published in the Oxford Journal of Rheumatology points out that low vitamin D levels are common in people taking 800IU of oral vitamin D3 (the amount recommended as the upper limit.) While it is true that ultraviolet damages the skin on a cellular level (much like exercise damages muscles on a cellular level), it also triggers the repair mechanism that tells damaged cells to commit suicide. Also more evidence shows that regular, moderate UV exposure actually helps to prevent rather than cause melanoma. One theory is that by exciting the production of vitamin D (not the vitamin D itself, but the process itself) actually helps keep melanoma in check. So if the doctors know about these positive effects why are they telling you the exact opposite? They don’t want you to get melanoma, right? Well according to a study done by Brigham and Women’s hospital, the risk of melanoma does not change significantly by where you live. If you live in Atlanta you get more UV exposure than you get if you live in New York but you don’t have a greater risk of melanoma.